THOMSON BATTLES THE ALGORITHM: SOCIALS SHOULD PAY US! Rupert Murdoch, Thomson uses alliterative attacks as part of a decade-long crusade to pressure Silicon Valley for a greater share of its advertising revenue. Now, Thomson, 56, is taking his campaign against Facebook a step further: He wants the social media giant to pay publishers for their content, the same way a cable TV company pays Walt Disney Co. to carry ESPN. Once a lonely gadfly poking at tech giants like a modern Don Quixote, Thomson is now finding that other media executives publicly back his quest. At a Recode conference last month, BuzzFeed co-founder Jonah Peretti agreed that Facebook should share more revenue generated by its News Feed with media outlets. On a recent earnings call, New York Times Co. CEO Mark Thompson expressed optimism that demand for quality news has created “the possibility of direct payment from distributors.” Martin Sorrell, CEO of advertising giant WPP Plc, said in January that he supported such a proposal. Former TV journalist Campbell Brown, head of Facebook’s news partnerships, was noncommittal when asked about whether the company would cut more checks to media outlets. “I would never say never to anything,” Brown said at the Recode conference. A Facebook Inc. spokeswoman declined to comment, as did Google. Media executives may view this moment as their chance to negotiate more favorable terms with Facebook, which is under fire for allowing Russians to spread fake news and meddle in the 2016 presidential election. But they also probably feel a sense of urgency. 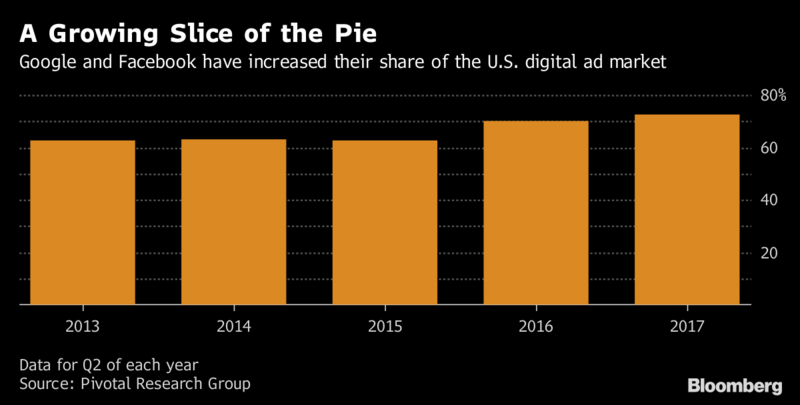 Facebook and Google account for about three-quarters of U.S. online advertising, leaving fewer dollars for publishers. A significant share comes from selling advertising against news articles served up by web searches or that users post in their news feed. fired 50 employees in response to Facebook de-emphasizing content from media companies. Facebook has taken steps to help media outlets boost their subscriptions. It also has paid them to experiment with new initiatives like live video and let them keep all of the revenue if they sell ads around articles that are published directly on Facebook. But in a statement in January, Murdoch said that wasn’t enough and that Facebook should pay “trusted” media outlets a fee for all of their content. Thomson said he sees no difference between Facebook acquiring the rights to stream professional surfing, as it did in January, and licensing the rights to quality journalism. News Corp. has made similar noise before. In 2009, Murdoch suggested he might remove his newspapers’ articles from Google’s search results if the tech company didn’t pay him. Google never did, and Murdoch focused on creating paywalls for his newspapers instead. Murdoch split the original News Corp. in two in June 2013, giving 21st Century Fox Inc. the more lucrative entertainment assets and leaving the current News Corp. with his print properties, which also include the book publisher HarperCollins, an online real estate business and newspapers in the U.K. and Australia. Bloomberg LP, the parent of Bloomberg News, competes with News Corp. in providing financial news and services. Thomson said News Corp. hasn’t decided what it will do if Facebook ignores its latest proposal, or how it could withhold its articles when Facebook users could share them on their own. The idea was meant to start a conversation, he said. Other publishers credit him with nudging tech companies for better business terms. David Chavern, president of the industry trade group News Media Alliance, said Thomson was instrumental in persuading Google last year to change its “First Click Free” policy that had led publishers with strict online paywalls to appear lower in search results. “What movement you see from the two tech platforms is due in large part to his willingness to call them out and ask for a better deal,” Chavern said. Mark Zuckerberg at a conference in Sun Valley, Idaho, and threatened to criticize the social network more publicly if it didn’t start offering a better deal to the news industry, according to an article last month in Wired magazine. In the past two years, News Corp. has spent at least $1.1 million lobbying Congress on various issues, including “online platform competition,” according to disclosure forms. Thomson says U.S. regulators should study whether Facebook and Google use their algorithms to disadvantage publishers and other businesses. He has company: At a conference in Barcelona this week, CNN President Jeff Zucker said regulators should pay closer attention to the power of Google and Facebook. Thomson also would like to see regulators scrutinize another tech giant, Amazon.com Inc., for being both a major search platform and a dominant seller of audio books, calling it “a serious issue for regulators.” Amazon declined to comment. “It’s fair to say I have algorithm angst,” Thomson said.